One of the strengths of Phi Beta Sigma Fraternity, Inc. has been the global reach of our membership. 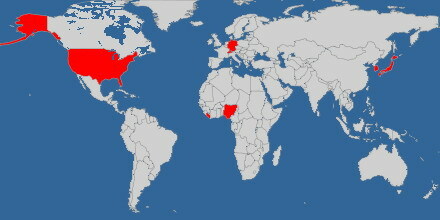 We have had chapters in foreign countries since 1950. Here are the countries that have Sigma chapters: Switzerland, Nigeria, U.S. Virgin Islands, Bahamas, Japan, Liberia, Germany, Korea and even Hawaii and Alaska (I know they are part of the United States, but they are so far away!). Iota Gamma Sigma Alumni Chapter, Mainz, Germany, founded February 1985. I have reviewed several membership directories and old Crescent magazines and we have brothers living around the world: Bermuda, Canada, Jamaica, Saint Kitts Nevis, Saudi Arabia, Belgium, Denmark, Holland, Trinidad and Tobago, Zambia, Gambia, Italy, Puerto Rico, and West Indies. I personally know we have members who are from numerous Asian countries. So if you really want to promote Phi Beta Sigma Fraternity, Inc., make it known that we are the “true” international fraternity with a worldwide diverse membership! How are the sigmas in Japan?? Is everyone there OK? I am visiting Puerto Rico, If there are any Sigmas there please contact me 1914omar@gmail.com. So we can exchange numbers,.